Elitist, sexist polygamist cult: That’s what I thought The Church of Jesus Christ of Latter-day Saints was before I investigated. I never thought I’d become a member, and I certainly never thought people would ever think such things about me. When I was baptized in December of 2009, I felt elated. I felt like the goal I’d been working toward for so long had finally been reached and that my baptism was going to be a blessing for eternity. What I had forgotten is that Heavenly Father gave us a temporal existence to learn, and I still had a lot of learning to do. Mills College is a private, all-women’s liberal arts college in Oakland, Calif. Its population of less than 2,000 students — that includes graduate students — creates benefits like small class sizes, strong relationships with faculty and staff, and generous scholarships, all of which motivated me to attend. Because I wasn’t a member of the church yet, I didn’t really consider what it would be like to be a member there when I sent my acceptance letter. And I’m glad I didn’t. Being the only member on a campus that identifies with issues of social justice is not easy. When people find out that I’m a Mormon, their initial reaction is often unpleasant. They think of the awful interactions they’ve had with Christian conservatives, the supposed “Mormon agenda” in regards to Proposition 8 and all of the stereotypes they’ve heard about the church over the years. To many, being in an environment where such reactions are common seems somewhat masochistic. But for me, it embodies what Jesus Christ has commanded us to do: “Go ye into all the world, and preach the gospel to every creature” (Mormon 9:22). Christ did not say every willing creature, nor did he say to preach only in places where people have a general understanding of what the church believes. I tell people who I am, what I believe and why. I go to church every Sunday. I pray morning and night. I do these things for the sake of knowledge, so that others may know the truth and then decide for themselves what they think of the church, its members and its gospel. Most of the time, people shrug and go on with their daily business. But other times, I see a change. Someone asks me to pray for them before they take a test. Another decides to try doing their homework on Saturday rather than Sunday to have a day of rest, too. It is those who make small changes in how they look, act and believe who make being the only active member on campus worthwhile. The next time someone gives you a look of repulsion when they hear the word “Mormon,” consider it a blessing. Heavenly Father has given you an opportunity to talk about your faith, an opportunity that should never be taken for granted. I choose to “pray for them, and shall not cast them out,” for I know there’s always the chance that, someday, I won’t be praying alone (3 Nephi 18:23). Stephanie Scerra is a sophomore at Mills College. 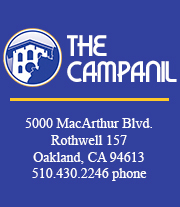 You can contact her at scerra@thecampanil.com. As a Mills alum who is also Mormon and who sometimes felt out of place there because of anti-Mormon remarks by classmates, I appreciate Stephanie’s openness and willingness to be herself. I’m sure she is making a difference at Mills.